Are certain days “better” than others to terminate employees? 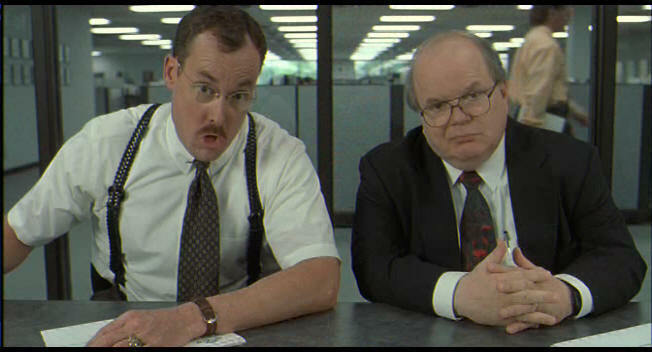 As we all learned from Office Space, "studies have statistically shown that there's less chance of an incident if you do it at the end of the week." I have also heard that Mondays are better, because it allows the former employee to immediately start looking for new work, and theoretically cuts down on the individuals from stewing over their job loss during the weekend, hopefully resulting in less incidences of retaliatory violence. Has there been any study that shows real benefits to terminating an employee's job on a particular day of the week? Edit - to clarify the terminology, I am referring to any form of termination of employment, and not specifically "termination for cause", which is a common interpretation of the term "fired" (but not the only one). Many managers have preferences about when and how to terminate employment. Some managers say Thursday is the best day to fire an employee, so that the other employees will have a chance to discuss the matter on Friday and come in ready for work the following Monday (Butcher). Many managers believe that Mondays and Fridays should be avoided (Ward). The time of year should also be considered when making the decision to fire. Terminating and employee right before a holiday, such as Christmas, is not only ethically disturbing, but may make that employee more likely to file a lawsuit against the organization (Ward). Many times, employers fire employees either very early or very late in the day so that the individual will have time to gather his or her things out of the sight of other employees. In truth, there is no correct time to fire an employee. Instead, the manager should be practical, picking a day and time when everyone concerned is able to meet (Rubin). The article references numerous publications from business and management journals and magazines, some of which are peer reviewed. Still, of these publications, I haven't seen any studies done which attempt to correlate incidents of law suits and/or violence with the day an employee was fired. Responses tend to be based on reasoning and management experience. I'm pretty interested in this, so I'll keep looking and edit the response if I find any statistically based studies. 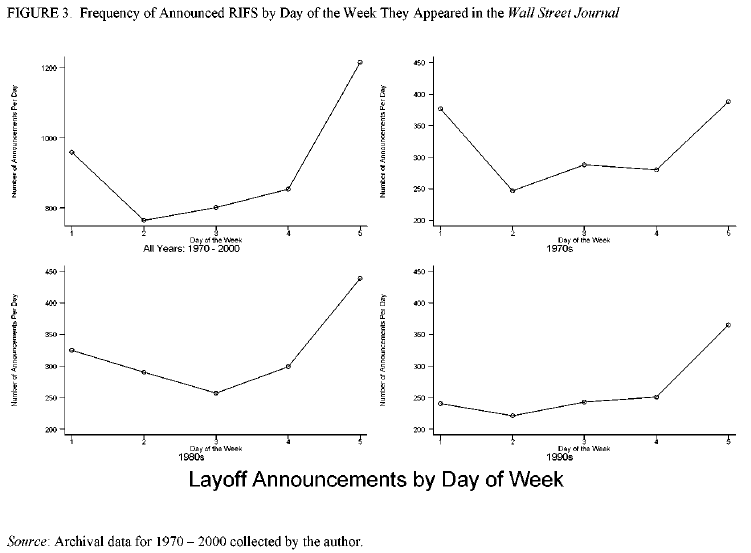 in all decades Friday is the most common day for an announced layoff, and Monday is less important over time. Workplace Shootings, US Bureau of Labour Statistics, July 2010 - Good resource for occupational homicide statistics, but none of the selected characteristics include the circumstances of termination. Not the answer you're looking for? Browse other questions tagged psychology employment . Are youths that watch violent X-rated material 6 times more likely to force others sexually? Is dishonesty more prevalent in certain cultures/countries? Did this study show that singing some vowels is “more joyful” than others? Is skepticism more influenced by one’s milieu than other personality traits are?